ST. AGATHA - Don Guimond will again serve as chair of the Northern Maine Development Commission (NMDC) Executive Board for the new fiscal year. The Fort Kent town manager was nominated for a second term as chair during the NMDC annual meeting held Thursday, June 26, at the Lakeview Restaurant in St. Agatha. Christy Sirois, Town Manager of St. Agatha, was selected vice chair, Christina Therrian, town manager of Madawaska, treasurer and Austin Bleess, city manager of Caribou, is secretary for 2014-15. 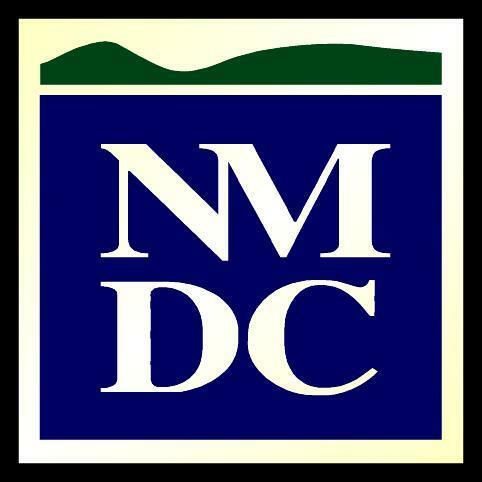 Also at the annual meeting, NMDC Executive Director Bob Clark presented the annual report for the organization. Clark highlighted a number of programs that directly benefited the residents of Aroostook and Washington counties. "Last year in the Jobs Innovation and Acceleration Challenge grant NMDC provided tuition assistance for 40 people studying engineering and related fields," said Clark. "We had initially planned on 30, but interest in the program was so great we expanded the number to 40." Part of the grant was to increase the number of renewable energy workers, specifically in the mechanical and electrical engineering, biological technicians and engineering manager fields. Procurement Technical Assistance Center (PTAC) assistance lead to more than $14-million dollars in federal and state contracts in Aroostook and Washington counties. The cooperative purchasing of salt saved 51 municipalities in the region more than $126,000. The Northern Maine Brownfields Initiative paid for 10 Phase 1 environmental site assessments and two Phase 2 assessments. The primary goal is the cleanup of properties for future economic development. Awarded $275,000 to boost domestic manufacturing, specifically to assist the Forest Products Industry Cluster. Clark pointed out only a few examples and urged NMDC members to take the opportunity to review the annual report, which can be found on www.nmdc.org. Guest speaker Leo-Paul Charest, Executive Director of the World Acadian Congress, updated the members of the latest with the event. The World Acadian Congress is a major celebration of Acadian culture and history held every five years since 1994. In 2014 from Aug. 8-24, more than 300 activities, including more than 100 family reunions, should attract up to 50,000 visitors to northern Maine, northwest New Brunswick and Temiscouata County in the Province of Quebec. The estimated economic impact is $55-million, but organizers want to make sure the ripple effects last for many years after the congress closes. "We want to continue past 2014 and leave the Acadia of the Lands and Forest territory with a lasting economic legacy," Charest said. PRESQUE ISLE - Registration is now open for the upcoming Aroostook Partnership for Progress "Education to Industry" Summit II. The summit, which is a follow-up to a similar event last summer, is set for Thursday, Aug. 7, at the University of Maine at Presque Isle Campus Center from 8 a.m. to 12 p.m. 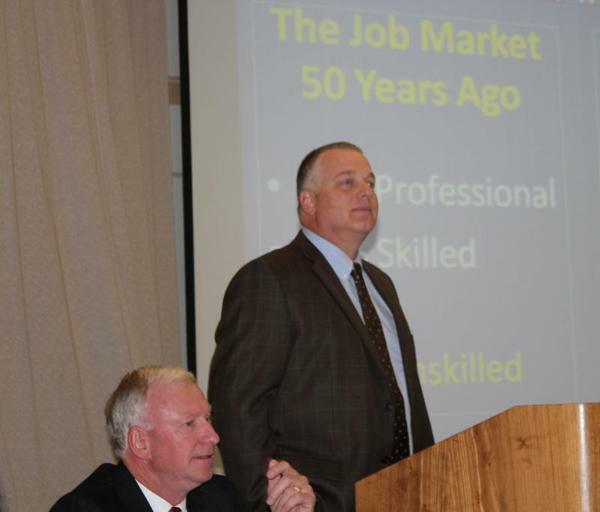 The first summit brought awareness about the growing need for skilled workers in Aroostook, especially in the 18- to 44-year-old demographic, and the second summit will highlight best practices and expand on needs for County students to gain a better understanding of job awareness according to APP President Bob Dorsey. The summit is part of a larger APP "Education to Industry" initiative, which looks to promote more job shadowing and/or internships to show middle, high school and college students there are good jobs available in the region as long as job seekers strive to have the necessary training and skillset. SAD 27 Superintendent Tim Doak addresses the crowd at the "Education to Industry" Summit last August. Also pictured is APP President Bob Dorsey. "Last year we set the stage - here's the sense of urgency, this year the theme will be more of a call to action," said Dorsey. "We want to show positive examples of programs in different schools which introduce students to business and industry in Aroostook County." Dorsey added that at the summit last summer attendance by business people was very good. This year he said a greater push will be made to attract more teachers, school officials and school board members to attend. Also at the summit, Dorsey indicated he would like to talk about the successes in the past year. 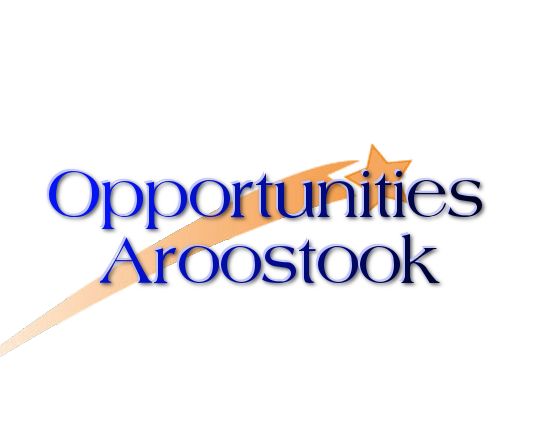 Those include an increase in internship opportunities in Aroostook County, growing the Junior Achievement program in the region and momentum gained in the Aroostook Aspirations initiative. Electronic registration for the free event is available at, http://events.constantcontact.com/register/event?llr=ziygt7jab&oeidk=a07e9i9xl5bd2d79555. To truly appreciate visiting Aroostook County, it is important to look back on what helped make this region special. Mike Fawcett, of The Idea Factory, created this video for Aroostook County Tourism.